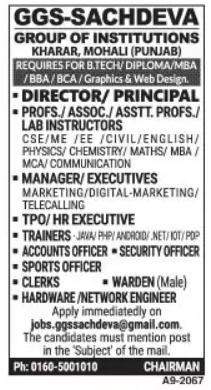 GGS-Sachdeva Group of Institutions, Mohali has advertised in the TRIBUNE newspaper for recruitment of Teaching Faculty- Professor / Associate Professor / Assistant Professor / Principal / Director jobs vacancies. Interested and eligible job aspirants are requested to apply immediately from 10th April 2019. Check out further more details below. About College: The GGS-Sachdeva Group of Educational Institutions was founded on one simple philosophy to create the best teaching and learning environment. Teaching philosophy is based on one key differential in pedagogy, therefore, we believe in not telling or teaching but showing the student what to expect and how to handle technology and business environment. Students of the GGS-Sachdeva Group are mentored during their entire stay by their seniors, teachers and industry leaders. We focus on providing global exposure to all the students. Our campus is visited by eminent faculty of academia from India and abroad and our strong national and international linkages make it easy for our students to get global exposure. How to Apply: Interested and eligible candidates are requested to send CV along with copies of certificates and PP size photos to the email address given below. Mention the post in the subject line of email.